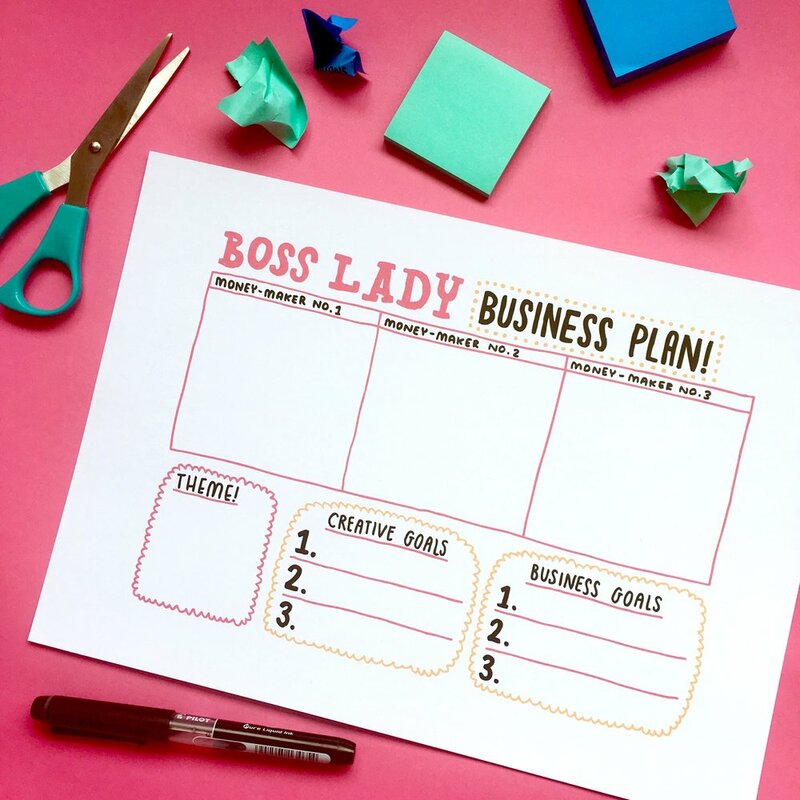 Boss Lady Business Plan Downloadable! As someone who works alone from my home studio, its very easy to feel a bit lost from time-to-time. I find that I regularly need to re-evaluate my goals & plans to stay on track and stay feeling inspired. So today I decided to make myself a little Business Plan template that I could fill out every year/every time I felt a bit lost business/creativity-wise. Half way through making it I realised that other creative freelancers might enjoy using it too! So I've made it a free printable file that you can download here! I use a sketchbook pretty much every day of my life. This might sound odd, but I've been thinking a lot about them lately. This started when I visited my parents in my childhood home. My mum asked if I could go through the abandoned stuff in my old bedroom. This was when I found about 50 old and mostly full sketchbooks. They ranged from young childhood to around the end of my Illustration Degree. They were like a time capsule of my life in creativity. Each cringeworthy drawing or ridiculous idea brought back a memory. I'm usually pretty good at chucking stuff away, but I can't help but to feel sentimental about sketchbooks! New sketchbooks - intimidating blank pages or a freeing opportunity for creativity? Almost every time I start a new sketchbook I have that panicky feeling. I like to call it the 'Judgy First Page Feeling'. Things that first blank page will say to you- "Don't screw up." "Woah, careful with that pen!" "Really?! That's what you're going to use me for?!" 'I'm expensive, don't you dare ruin me!" "Put the pencil down you plonker." But as soon as that first page is filled with interesting squiggles, genius ideas or random doodles, you can breathe a sigh of relief. That judgy first page feeling disappears. And that's where your adventure begins. I know it's cheesy but the possibilities really are endless. What can sketchbooks be used for? Do you like to work on a teeny-tiny scale, or is bigger better? Do you want lots of pages to use as an on-going creative journal, or less pages for a small project? There are a huge range of sketchbook shapes and sizes available. Do you like to use double page spreads? Or do you prefer a ring binder that you can flip open to one page? What materials will you be using in the sketchbook? Does the paper need to have a high GSM? Smooth or rough surface? To share or not to share- that is the question. The game-changer for me was the moment I realised that the sketchbook can be just for me. I didn't have to show ANYONE, ANYTHING. There's something very freeing about realising this, you stop caring about what anyone else thinks, and start getting to the good stuff. Between those pages is a safe place to gather your ideas, without the judgement or opinion of others getting in the way. Obviously there are times where sharing your ideas is a good idea. When I was at university we did group 'critiques', where you would share your sketchbook with others in order to get constructive criticism. Listening to other peoples opinions on your ideas often sparks new ideas and can be a massive help to the end result of the project. Get yourself a sketchbook buddy you can trust! If you are interested in sharing your work, then consider sharing on a platform like Instagram. It can be a brilliant way of showing others your creative process, meeting people with similar creative interests & if you are a freelancer, it's great self-promo! However, be aware of over-sharing, if your ideas are in the very early days and you are worried that someone could steal the idea, then exercise caution. Sketchbooks may not be for everyone! I'm obsessed with them so I'm massively biased. But I know plenty of people who prefer other ways of work rather than sketchbooks. A tablet, notebook, camera, or collection of objects might be the perfect way of you gathering your ideas into one place. Creativity is different for everyone, so try out lots of ways of working, then choose your favourite! I've heard a lot of people don't use sketchbooks because of the judgy first page feeling, but instead opt to use cheap printer paper to relieve the pressure. This is a great idea if you still want to use paper, but you don't feel like sketchbooks are for you. For a while now I've found that I work best when I have a few sketchbooks on the go at one time, each for a different project or purpose. For the last few years I've filled around 5 of these chunky square sketchbooks which I find the perfect size and shape for what I need. I use sketchbooks primarily to come up with ideas, then I develop on them using small thumbnail drawings, finally, I sketch out my final ideas before taking them onto the computer. I also like to use mini sketchbooks when I do daily drawing projects as they are a perfect size for a quick drawing, and they are small enough to carry with you wherever you go. It's the start of a new year & I'm feeling very fed up of the cold dark winter and am so ready for a fresh, productive and vibrant start to 2018. 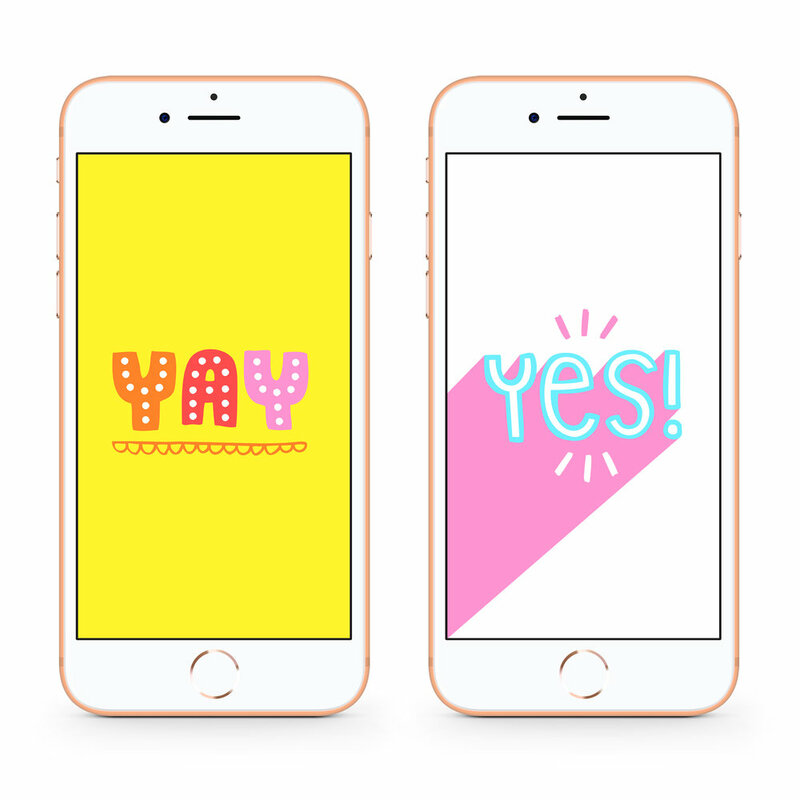 I've created these wallpapers to send out colourful, positive vibes to anyone else feeling the winter blues! Download them at the links below! Working as a Freelance Illustrator is awesome. It's an exciting, varied, creative job, where you have the freedom to work on your own schedule and be creative. It's also the biggest challenge of my life. Amongst many of the obstacles is the constant fight to stay creatively inspired. Working alone and from my home studio, I've needed to come up with my own ways to stay inspired & motivated so that I can continue creating the work I want to make. The 'lightbulb' moment is the ultimate goal. You are hit with a rush of inspiration, you act on it, then create the best work you've ever created. These days are the best. However from my experience the 'lightbulb moment' is few and far between. Inspiration usually takes time, effort and dedication. I find the best way to stay consistently inspired is through opening your mind to new things, seeking them out & gaining ideas in return. There are lots of ways that you can stay inspired, in this post I'll be sharing my favourite ways, all of which I use myself on a weekly, or even daily basis. I am in no way a constantly inspired, creative ball of energy, I still have days where the blank page in my sketchbook scares the hell out of me, but I find that I can usually get out of the creative block by trying out one of the following. You know that cool book that you bought a year ago that has not left the shelf since that moment of madness/inspiration that make you buy it in the first place? Thats the one. Find the time and pick it up. I am the biggest sucker for an inspirational book, but really have to push myself to find the time and actually read it. As a slow reader (I have dyslexia) I can find it pretty intimidating to start a book. But I have never regretted the time spent reading books. Sometimes just flicking through and looking at the pictures is actually the perfect pick-me-up. You don't even need to spend money on this one if you don't want to! Check out the Art/Design/Craft section of your favourite bookshop, or venture into your local library, it may seem old fashioned, but its a perfect way to flick through books for free! Check out my Top 5 Creative books here! Setting the right mood for creative inspiration is very important, what you listen to when you are creating can drastically change how you feel. Spotify is now my best friend, you can find playlists based on your mood, or create your own from your favourite artists. It's good to keep it varied though and podcasts & audiobooks are great for mixing it up. Get recommendations from your friends or family and try some out! I'll soon be writing a Top 5 Creative Podcasts blog post on here so keep an eye out for that too! This ones a bit of a no-brainer! Creative blogs can be a great source of inspiration and there are so many good ones! Some of my faves are CreativeBloq, Creative Review, It's Nice That & Creative Boom. A cup of coffee & a quick read through blog posts is such a nice way to start the day! It's also a perfect way to keep up to date on current trends & news within the area of creativity you are interested in. This one takes time, but can be a game changer. Whether modern art or ancient artefacts are your thing, museums & galleries are an immersive & inspirational experience. To get the most out of your visit take a sketchbook or notebook and some drawing materials and jot down/sketch while you are walking around. The free exhibits are great, but sometimes the temporary exhibitions can be well worth the money, its also good to have a little day trip out & venture to a different city to really mix it up & get inspired. There are a few things you can do in 'everyday life' that can help you to feel creative. Getting creative with your office/studio space is a good way of feeling inspired. Surround yourself with objects that you love, and mix it up occasionally to keep it feeling fresh. Find & wear the clothes that make you feel happy. I always find this such a good pick-me-up when I'm feeling uninspired. Wear your favourite loud rainbow-stripe jumper, or those 5-year-old horrible but extremely comfy slippers - we won't judge. I love cooking and I find trying out new recipes & adapting old recipes fun. Try to think of ways that you can get creative doing something you enjoy in your everyday life. As an introvert, this one is tricky. I work alone from my home-studio, which day-to-day is my idea of heaven. However, it can get pretty suffocating. Getting out and about helps, but sharing your ideas with other humans can be totally freeing. Finding that friend who understands your creativity is brilliant. However if you don't have that person in your life yet, then reaching out to fellow creatives via social media is now easier than ever. The nice thing about Creatives is that they are great supporting each other & giving advice, because every creative person experiences lack of inspiration at some point! Pinterest is a great source of visual inspiration. Its basically a digital pin-board where you can scroll through images and compile them into your own 'boards'. Pretty much whenever I start a project I like to create a project inspiration board which I can add to and adapt throughout the project, as well as referring back for a hit of visual inspiration. The old-fashioned version of the above! There is still something really nice about having a physical pin-board in your creative space. I personally have one on the wall next to my desk and I am constantly searching for inspirational material to add to it. The process of collecting inspirational images and assembling them onto your board is a lot of fun too. Journalling is the only thing on this list which I havn't tried yet! I will definately be trying this in 2018! Journalling is a creative way of using a mixture of sketches and words to process your thoughts & ideas. Reflecting back on your journal can be helpful and inspiring. Search 'Bullet Journal' on Pinterest for some ideas of how to do this one! Keep an eye out for upcoming creative events as these can be such a boost of inspiration. I search Eventbrite regularly to find events in my local area. They are often free (LOVE a freebie!) and can be a great way to meet fellow Creatives. Its also good to follow galleries/creative spaces on twitter to get the latest updates on upcoming events. As a Freelance Illustrator I create work which is in my own visual language, however I also try to keep it relevant to current trends & styles. I've found that to keep up to date with these current trends and to stay inspired by them requires a bit of work! Aside from using Social Media platforms (especially Instagram) to see what it 'Trendy' (that word urgh.) I also like to go out into the 'real world'. Craft fairs are great because you get to see whats new, while also helping to support small businesses, and meeting other creatives. As someone who has an Etsy shop selling cards I also like to go into my favourite card shops and see what the latest trends are. I do feel the need to mention that this is about finding trends, not copying other people designs! Copy-Cats are not cool. Let the process of seeing other people's work inspire you to create your best work in your own style. How do you stay creatively inspired? I'd love to hear in the comments! There is nothing that makes me happier than walking down the christmas decoration aisle and basking in the immaculately colour themed baubles all lined up. However, what makes me even more happy is the trend towards more unique, fun and personal decorations. For christmas this year I decided to try out decorating my own baubles. I bought these mini white baubles on Amazon, and a couple of Sharpie permanent markers (I used these fine point ones), and basically just went crazy! It was really fun to try and come up with a unique design for each little bauble. Perfect for the christmas tree and to use as christmas present decorations! 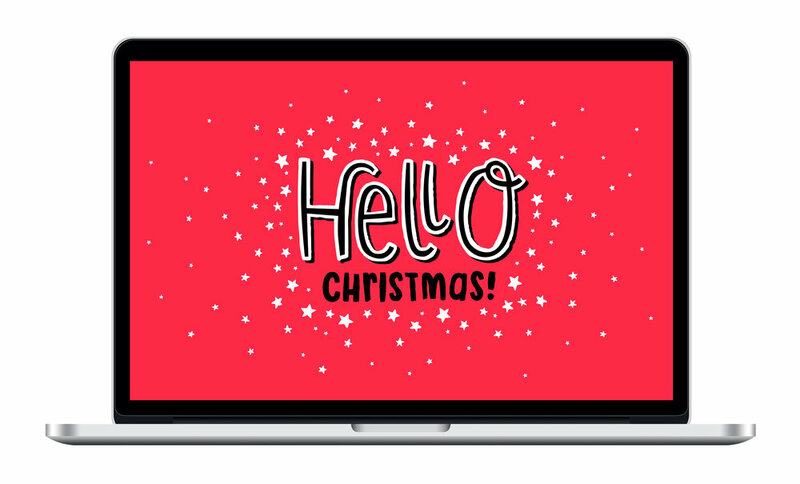 These sweet Christmas-themed background are the perfect way to add some festive joy to your tech! Download them for free at the links below! We've all heard this. From a friend, from a family member, from yourself? This is one of those sayings that makes me cringe every. single. time. For me, this phrase usually pops into conversation after the person hears that I'm an illustrator. 'Oh wow, that's pretty cool, I can't draw!'. This is sometimes followed by me handing them a pen and seeing what they do. After creating a fabulous drawing of a stick man or a cat or a house, they hand it to me and say, 'told you so!' What they often don't think about is that they have just mistakenly lied. The moment that a pen or pencil touches down, a new & unique drawing is created. I bloody love seeing a non-drawer draw. Yes, it may result in a wobbly naive drawing of something they used to draw over and over as a kid, but who cares?! Beauty is in the eye of the beholder after all! 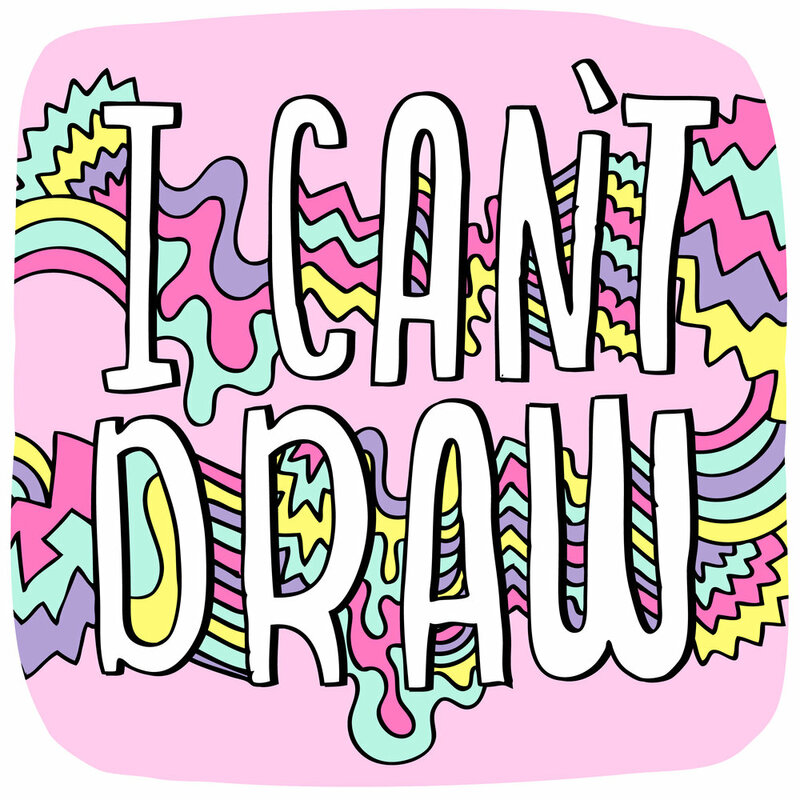 What I think they actually mean is 'I don't draw'. Two VERY different things. The sad truth is that it seems most people have had their creative confidence knocked. Whether it's a pushy teacher, nervous parent, or jealous friend, quite often its simply a small comment that makes you think, 'yeah, you're right, it is crap'. Leading to you giving up on drawing entirely *cries for all the missed opportunities for amazing art*. However I fully believe that its never a bad time to start/continue/experiment with drawing. You are never too old, or too busy, or too un-creative to draw. One thing which I wish they taught you at school is this- THERE IS NO RIGHT OR WRONG WAY TO DRAW. You just have to put pen to paper and voila! Call me Picasso. Personally I couldn't give a damn if you can't draw an accurate representation of a nicely presented bowl of fruit or a perfectly proportioned person. That's not really the point. The point is to draw what YOU want to draw. To create whatever YOU want to create. To reflect your personality on paper. To me, these will always be the most interesting drawings, no matter how technically imperfect they are. Next time you think about saying 'I can't draw', think again, then pick up a pen and see what happens. 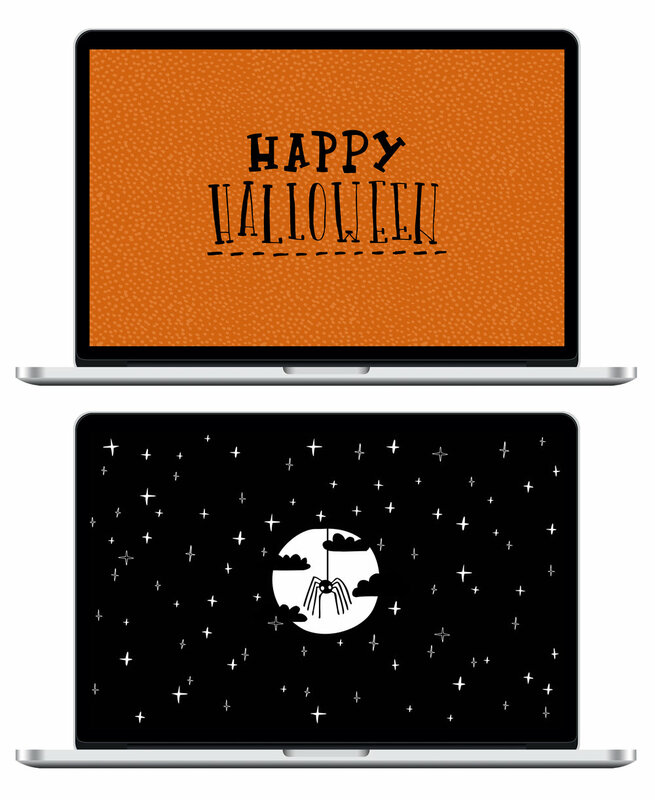 To celebrate Halloween 2017 I decided to create and share some spooky-cute Halloween themed desktops & phone backgrounds! Download them for free using the links below! Have a Happy Halloween everyone!